Notary & Apostille Service, Inc. can provide you with Apostille Service for your New York Birth Certificate. Apostille Service is available for all areas of New York State. The procedure maybe slightly different depending on the kind of Birth Certificate you have, but that is not a problem for us. You must have a Birth Certificate that is issued by the State of New York or the City of New York and is signed by the Director of Vital Records or by the City Registrar, who is currently Steven P. Schwartz. 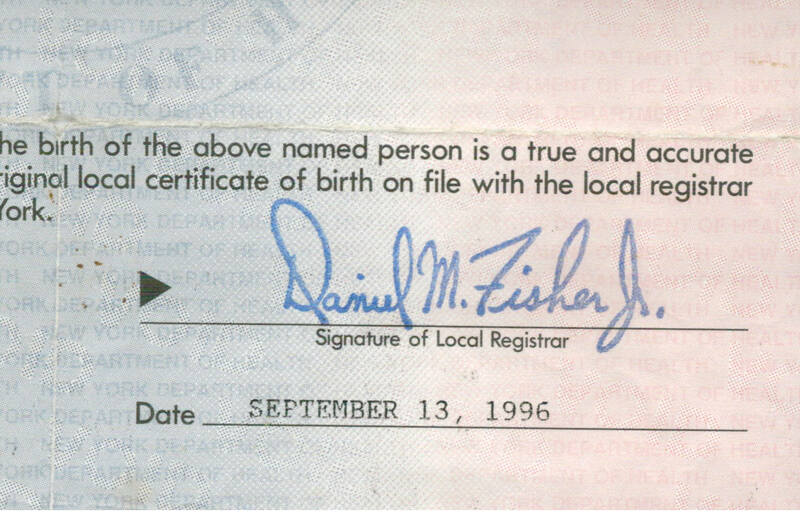 For Nassau County & Suffolk C0unty on Long Island, if your Birth Certificate is locally issed by a town and is signed by a Town Clerk, Local Registrar or someone else, then you must have that signature Authenticated by the County Clerks Office or it must be Exemplified by the court. Notary & Apostille Service offers several levels of processing to fit you budget or time constraints. We offer Same Day Expedited Service, Next Day Service or to save you money we also off service that takes up to 5 business days. To get started you will need to mail us the orginal Birth Certificate and our order form. Notary & Apostille Service, Inc., is a private company, we’re not related to any governmental agency, that can help you expedited your documents throught the various government agencies to legalized (Apostille) your document for use in a foreign country. We have been doing this since 2009. We are a New York State company that offers you a Safe, Reliable, & Affordable Apostille Service.